Mom, the Intern: Random thoughts. Sorry for the lull in blogging lately. I actually wrote up a pretty lengthy post in response to this article but I'm not sure I want to publish it. Not that I said anything too controversial ... it's just I have a lot on my plate right now and I'm not sure I want to open the floodgates of criticism or even casual discussion. Oh man, this post is sounding so dreary already. Let's talk about lighter things, shall we? 1) Bubby doesn't know it, but Dill's parents are taking her to Disneyland in a few days, along with a close-in-age cousin. So fun! I'm incredibly jealous as I LOVE Disneyland and even mustered up the strength to go when I was barely pregnant with Buckwheat (then a sesame seed Smush). My kids are clones, it's true. Dill's mom wanted Bubby's trip to be a total surprise, but I know Bubby, and if she were to suddenly find out she was going to be six hours away from her parents for half a week, she'd flip out. And not in a good way. So she knows she's going on a trip to a far away place with Grandma and Papa, and she's going to stay in a hotel and go to "a magical place where you walk a lot." I can't believe she hasn't figured it out yet. Ah, to be four years old again. 2) So, my neck/shoulders/arms. Still pretty screwed up after a round of steroids. I went to my chiropractor Dr. A and he ordered an MRI, which was supposed to happen two days ago but alas, it didn't. So I'm going in on Monday. And I'm pretty terrified. I've had an MRI on my knee but my head didn't have to go into the machine for that. It was still a nerve-wracking experience. The machine is just so dang LOUD and you're all alone with only your thoughts and you're not allowed to move, yet the stupid machine keeps starting and stopping randomly at it surprises me every time. I'm really quite scared to have my whole body in that tiny, dark, noisy tube for half an hour. Advice and/or encouragement welcome. 3) I saw something on Pinterest and I have to share it with you. It's brilliant, unlike some things you find on that site. And it won't make you feel like a crappy mom! Want to extend the life of your mascara? Add 4-5 drops of saline solution (NOT contact solution, but can be found in the same section of your local grocery or drug store) to your mascara tube, swirl the wand around a little bit to mix it, and voila! You just bought yourself another month of mascara. I tried it -- definitely works. It also resurrected my liquid eyeliner. It's magic. don't be scared of going in the tube!! i was freaked out the first time i had to get one done i closed my eyes the whole time, but having done it a few times i've realized im not even that far in it just feels like it. something you should try is just listen to the humming of the machine, and after awhile it sounds like birds, it helped me stay calm. good luck. 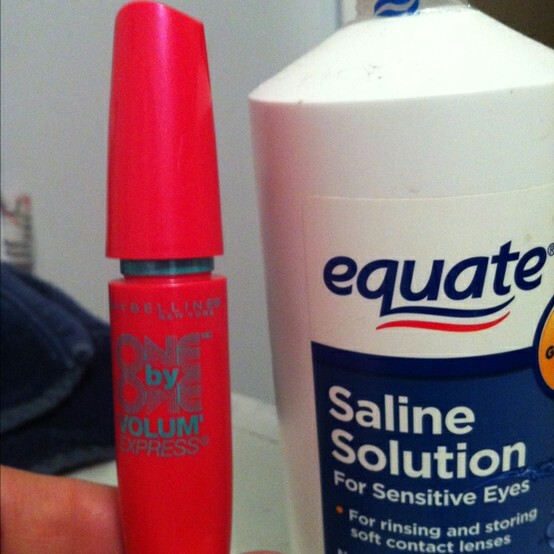 i've done that mascara thing works like a boss! All I had to read of that article was that the author was French. I need to try the mascara thing. Thanks. I was nervous of the MRI, too. I had to have it done for the three parts of the back (upper, mid, & lower), so it lasted closer to an hour. I actually did take my dr up on his offer for a chill pill which probably helped. Haha, that article was hilariously ridiculous! I want to know if she has kids or any sort of nurturing relationships in her life. Hope the surprise trip is awesome! The article...I have no words. Never had an MRI, so I hope it goes well for you! Think deep thoughts? Maybe light thoughts instead? I got nothin'. Will try the mascara trick, asap! oh my goodness, i think you should post your response to that article. I couldn't even make it half way through before i wanted to punch the ladies lights out. I had to stop reading in order to save my sanity for the day.